The smallest in our range, it maximises the available floor space and growing potential, making it an highly efficient greenhouse. Its compact, simple design means it is easily assembled and, due to its small size, generally no planning permission is required. It is ideal for sitting on decking or a simple patio and doesn’t need foundations. * Price exclusive of VAT and based on standard dome, supply only to UK mainland. ** Specifications subject to change. 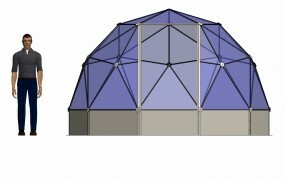 We provide a range of accessories, furniture and customisation options including an integrated base, shading, protective films and staging units to help you maximise the investment in your SOLARDOME® geodesic dome.